When a San Francisco Bay Area resident has suffered facial trauma, the physical and emotional damage can lower the quality of daily life. Whether the traumatic facial issue is affecting your ability to eat, breath or feel comfortable in public, a consultation with a surgeon specializing in facial reconstruction and facial surgery may be the next step. Facial trauma is different for each person and surgery may require a multi-talented, highly-skilled facial surgeon like Dr. Alex Rabinovich. His background includes extensive surgical training in facial trauma, reconstruction, jaw surgery, oral surgery and cosmetic surgery. Dr. Rabinovich has performed maxillofacial surgery in some of the most demanding trauma centers in the United States. Dr. Rabinovich also has access to the latest in technology and techniques for facial trauma surgery. Facial Surgery. In addition, many people suffer from facial issues that are genetic in origin. Perhaps they have an overbite or are not satisfied with the look of their face, cheekbones, or nose. In some cases, insurance may designate these procedures as cosmetic, and in other cases cover them in full. It depends, and if you are considering facial surgery, only a skilled surgeon can evaluate your needs and work with your insurance company to secure coverage, if at all possible. Facial Trauma. If you have suffered from facial trauma, or are suffering from post-trauma facial dilemmas, contact Dr. Rabinovich. He understands the various long-term problems associated with facial trauma and his goal is to give you the highest quality of life possible for your maxillofacial surgery. In the Bay Area, the best oral surgeon for facial trauma is Dr. Alex Rabinovich. 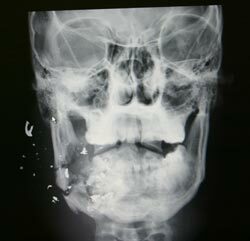 Facial trauma may be an isolated injury or a part of a more global trauma, involving multiple organs and systems. Facial reconstruction following trauma is different for each individual as it highly depends on the nature and location of the patient’s injuries. The first priority in any trauma patients is treating life threatening issues, including injuries to airway, brain and other vital structures. The second priority in treating traumatic facial injuries. The best way to prevent post-traumatic facial deformities is to obtain the appropriate treatment at the time of the injury by a qualified team of specialists. Delayed treatment has been replaced by early or immediate surgical treatment and stabilization of fractures. These new advances have allowed surgeons to approach and often reach the goal of restoring pre-injury facial appearance and function in a one-stage operative repair. Surgery following facial trauma may take many hours, as the goal is to repair as much as possible in one operation. Broken facial bones are held in place with titanium mini-plates and surgical screws. Lacerations (tears) in the face are usually closed with sutures. Dr. Rabinovich has unique qualifications in treating traumatic facial injuries. His training in cranio-maxillofacial surgery as well as facial plastic surgery is backed by experience of treating patients in some of the busiest trauma centers in the United States. If you or your loved one is in need of a facial trauma surgeon, we are here to help. The first appointment to discuss any facial trauma or face surgery issues with Dr. Rabinovich will be at our state-of-the-art surgery center, located at 129 Sacramento Street in San Francisco (near the Embarcadero Center). Dr. Rabinovich, will evaluate your injuries with the latest technology in a comfortable and calm environment. He will ask what issues you are experiencing and will discuss a treatment plan customized just for you. Remember, surgery for facial trauma may take one or several surgeries depending on the amount of underlying work needed. The point is that there is no single best facial surgeon in the Bay Area; rather, you want a surgeon who will work with you to define a treatment plan that best suits your needs. When choosing the best doctor to handle your facial trauma surgery, insurance should not be a barrier. Dr. Rabinovich not only offers top care in facial trauma surgery, his staff offers top customer service for evaluating insurance plans. All types of insurance is accepted such as – Delta Dental, Western Dental, Careington, Guardian, Ameritas, Humana, Renaissance Dental, Aetna, METLIFE, CIGNA Dental and several more. Check with us to see if we accept your in-network insurance provider when you call for an appointment. Once insurance coverage is confirmed, our supportive staff will help manage the dental insurance paperwork and financing. If you need support with dental financing, our friendly and knowledgeable staff will walk you through every option to find the best payment plan to fit your budget. Again, some patients may perceive an issue as cosmetic, but after consultation with Dr. Rabinovich, it may be possible that a procedure is not truly cosmetic. In some situations, facial surgery may be fully covered; in others, it may not be. The only way to truly know is to come in for a consultation in the San Francisco office with a truly expert facial surgeon, Dr. Alex Rabinovich.